England have withdrawn from the race to host the 2022 World Cup after the United States ended their bid to stage the 2018 tournament. England will now focus entirely on their campaign for 2018, which will definitely be held in Europe. This is because of Fifa rules that the competition cannot be held on the same continent on successive occasions. England and Russia remain in the running for 2018 along with joint bids by Belgium/Holland and Spain/Portugal. The United States had been the last non-European bidders remaining in the race for 2018 following Australia's withdrawal in June and remained in contention for both 2018 and 2022. Chairman of the US committee, Sunil Gulati, said: "For some time we have been in conversations with Fifa and Uefa about the possibility of focusing only on the 2022 bidding process. Should England host the 2018 World Cup? "We are confident this is in the best interests of the USA bid. We wanted to make the announcement now - still 48 days before the final decision - in order to make our intentions clear during the last part of our campaign. "This also enables Fifa to finalise the selection procedures during its upcoming scheduled executive committee meeting." That meeting will take place in Zurich on 28 and 29 October. Fifa secretary general Jerome Valcke said: "We have had an open and constructive dialogue with the USA bid for some time now, after it became apparent that there was a growing movement to stage the 2018 Fifa World Cup in Europe. "The announcement by the USA bid to focus solely on the 2022 Fifa World Cup is therefore a welcome gesture which is much appreciated by Fifa." A statement from the England bid team read: "England 2018/22 today confirmed to Fifa that it was withdrawing its candidature from the Fifa World Cup 2022 and will now focus on its bid to host the tournament in 2018. "This followed consultation with Uefa president Michel Platini on the most appropriate moment to withdraw. "England 2018 is delighted it is now clear that the Fifa World Cup will be coming to Europe in 2018 following the withdrawal of the United States bid." On Friday Prime Minister David Cameron met his Trinidad and Tobago counterpart Kamla Persad-Bissessar to canvas support. Persad-Bissessar is a political ally of Fifa vice-president Jack Warner, who is a member of her cabinet as well as head of the North and Central American football federation Concacaf. Concacaf has three votes on Fifa's executive committee meaning Warner is likely to have been an influential voice when the 2018 hosts are chosen on 2 December. Mr Cameron's predecessor Gordon Brown met Warner for face-to-face talks during a visit to Trinidad last year. After the meeting at Downing Street, a Number 10 spokesman said: "The prime minister congratulated Prime Minister Persad-Bissessar on her country's work as chair in office of the Commonwealth. "They agreed to work closely to help the organisation realise its enormous potential, particularly in fostering international trade. "The prime minister also updated Prime Minister Persad-Bissessar on England's bid to stage the 2018 World Cup and the lasting legacy the tournament could have worldwide, and encouraged Trinidad and Tobago to support England's bid." 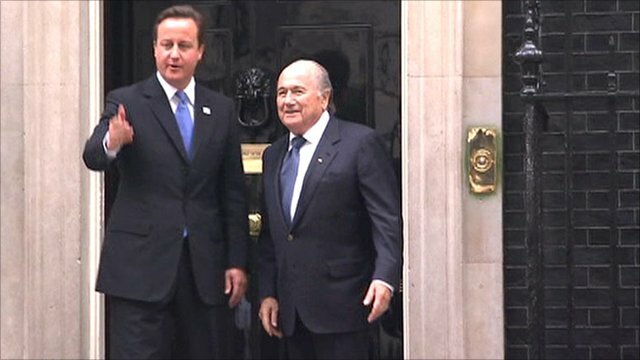 Fifa president Sepp Blatter visited Mr Cameron on Wednesday at Downing Street, where he saw a presentation by ambassadors for the England bid.